We are proud to be the nationwide shutter source for architects, builders, designers, and the general public. Plantation Shutters provide a classic window treatment that never goes out of style. Shutters add real value to your home, are as functional as they are beautiful, and will last a lifetime. Whether your decor is traditional or contemporary, custom plantation shutters will complement your decorating style and add charm and beauty to your home. Our Vinyl Plantation Shutters can do all of this at a very affordable cost compared to typical wood shutters. To learn more about buying and installing these great shutters, click through the links to the left or start right here. Please don't hesitate to contact us with any questions you may have about shutters or any window treatments you may be considering. 7 - 10 Day Production! Measure and install plantation shutters yourself and save money! Vinyl Plantation Shutters are not difficult to install and are easy to maintain. Most of the shutters we sell are installed by the typical do-it-yourselfer. Click on the links to the left to learn more about shutter features, measuring, mounting frames, etc., and please call us if you have questions. We have been installing window treatments for years and have the experience to guide you through the measuring, ordering, and installation process. 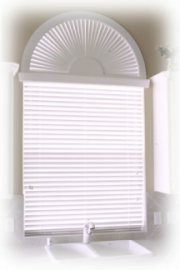 In addition to custom vinyl plantation shutters, we can help you with stock size traditional shutter sets, along with custom wood blinds, faux wood blinds, shutter blinds, cellular or honeycomb shades, bamboo shades, roller shades, mini-blinds, vertical blinds, and a variety of arch window treatments. Arched Window Treatments See Our New Tool To Simplify Cleaning Your Blinds, Shutters, & More! 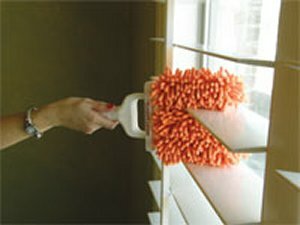 We now offer a great new duster especially made to protect the investment in your window treatments for years to come. 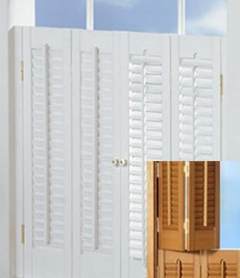 Shop our expanded selection of Stock Size Shutters Sets. These shutters are now available in both the traditional 1-1/4" louvers in both Faux and Real Wood, along with the plantation style 2-1/4" louvers. Get the great look of shutters added to your decor at an economical cost. These complete kits are easy to install and are quite affordable with FREE SHIPPING, except to AK or HI. 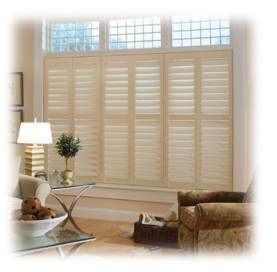 We Ship Plantation Shutters and Other Window Treatments Anywhere In The USA. Regardless of were you live, we are here to help you with your window treatment selections; whether it be shutters, blinds, shades, or a combination. Please write or call us, toll free, at , with your questions. We want to provide you all the information you need to purchase quality window treatments at affordable prices that add to the beauty of your home for years to come. Live in PA or NJ? 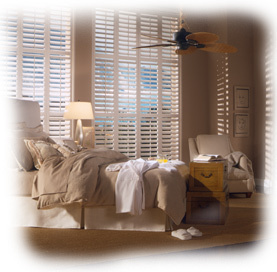 We offer installation of plantation shutters, shades and blinds in PA in Bucks and Montgomery Counties and The Main Line. In NJ, we service Camden and Burlington Counties and the Jersey Shore. There is an additional charge for this service. Please call us toll free at for availability in your area.